Grown without reliance on artificial chemicals and fertilisers. Good FoodA rich, warming organic soup, made with juicy Italian tomatoes, a splash of cream, balsamic vinegar, and thyme. Good FarmingOrganic farming works with nature using methods such as crop rotation and clover planting to build fertility in the soil. Good CausesSales of Waitrose Duchy Organic products provide a donation to The Prince of Wales's Charitable Foundation. This year, over £2.5m will be donated to the Foundation, supporting good causes across the UK. Since 2009, you've helped to raise over £17m for initiatives such as the Duchy Future Farming Programme, which helps farmers develop more sustainable farming practices. 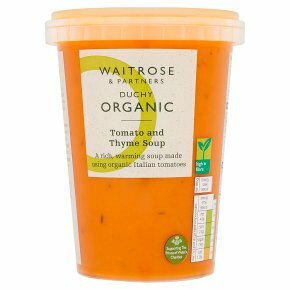 A rich, warming organic soup, made with juicy Italian tomatoes, a splash of cream, balsamic vinegar, and thyme. Hob. Time: 6 - 7 minutes. Stir soup as some natural separation may occur. Empty contents into a saucepan. Heat over a medium heat for 6 - 7 minutes, stirring frequently. Check food is piping hot. If not heat for a further brief period. For best results, serve hot.